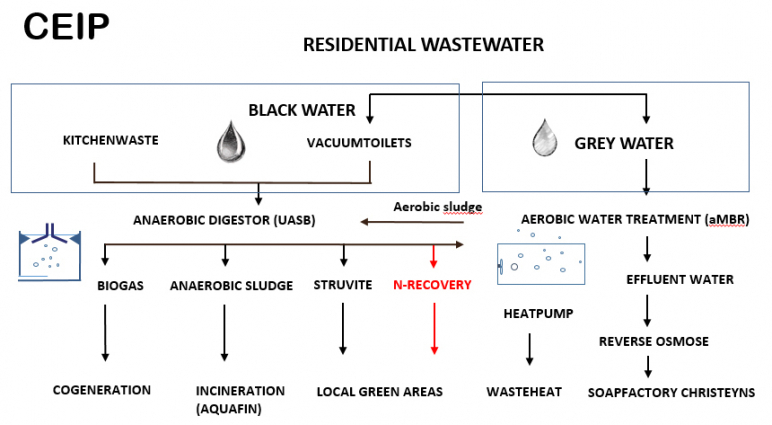 Clean Energy Innovative Projects will demonstrate an economically viable innovative business model for decentral residential wastewater treatment with integration of other sustainable technologies, like low-temperature district heating, resource-and water recovery and smart energy control system (storage and demand management). The real estate developer ‘Schipperskaai Development’ (Vanhaerents, Revive and Van Roey Development) was awarded the development of the ‘de Nieuwe Dokken’ site by the city of Ghent in 2014, partly as a consequence of CEIP's innovative approach on recovery of energy, nutrients and water (the ‘ZAWENT’ technology’). CEIP and other 'impact captial' investors established the sustainability cooperative DuCoop, who will invest in a 4th generation heating network providing the 400 apartments in ‘de Nieuwe Dokken’ with central heating and sanitary hot water. Sustainable waste heat from biogas and a heat pump, will provide enough energy to cover up to 1/3 of the district’s heat demand of 2.500 MWh. The remaining heat demand is provided by low-range (55°C) waste heat from nearby industry (chemical plant Christeyns), which will provide sufficient heat at any time. At full deployment, the district will be an example of circular economy with yearly re-use of over 30.000m³ of city water (>90% of the total consumption), production of over 500 MWh of waste heat from waste water and biogas from local organic waste, recycling of 1.500 kg of phosphate rich crystals for the local urban agriculture project. Furthermore, thanks to the construction of low energy housing and abundant locally and offsite produced renewable energy, the district will be climate neutral. CEIP joined forces with knowledge institutions, public and private partners in the Horizon 2020 programma Run4Life, to demonstrate the potential of nutrient recovery with decentral waste water sanitation systems. The Horizon 2020 programme delivers significant financial support to make the demonstrations possible and create the tools to allow roll out of these techniques throughout Europe and the globe.